We are thrilled to announce that Zocket CEO and co-founder Sabine Hutchison will be leading round table discussions at next weeks Healthcare Businesswomen’s Association European Leadership Summit in Berlin. In interactive sessions, she’ll be talking about biases in hiring and how to limit them to generate a diverse workplace. Did you know, every second employee thinks their company should be more diverse? It’s clear that attracting, diversifying and retaining top talent is no longer simply the responsibility of HR. With the rise of social media and digitization, employees now have loud voices and strongly influence employer brands. Thus, business leaders and executives are more and more concerned about building an unbiased application process and strong employer brand. And all this starts with a compelling company’s online presence. The ways in which companies represent themselves online can create invisible biases that then unconsciously turn certain candidates off from wanting to apply. These particular candidates might be the perfect fit for the job and comprise untapped potential for companies. In today’s transparent online environment, top talents chose their employer and not vice versa. Therefore, it is crucial to assess and understand their experiences when applying to work for you. Zocket CEO and co-founder, Sabine Hutchison, will delve into this subject at the HBA European Leadership Summit in Berlin, 11-12th October. More specifically, she’ll be leading four round table discussions on biases in the application process and company’s online presence. 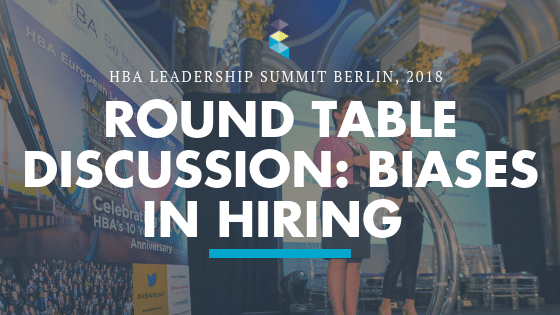 By examining employer websites, Sabine will break down how companies accidentally create these unconscious biases and how to remove them to attract and diversify the best-fit talent. Does this sound interesting to you or want to learn more about how to limit unconscious biases, get in touch with Sabine and meet up at the summit. At Zocket, we help companies future-proof their hiring. Our Talent Attraction Solutions evolve the way you attract, retain, and diversify the best-fit talent. Watch the video below and learn more about our candidate experience assessment. Do you want to make candidate experience and career progression the focal point of your company? Let us help with our candidate experience assessment or employer branding platform.